They may not have lush tropical foliage or fast growth, but cacti and other succulents have other advantages as houseplants. Their water-storing capability allows you to miss watering them a day or two without having a dead plant. They thrive on the low humidity and warmer temperatures of most homes. Slower growth means they have a smaller footprint, and they don’t need constant maintenance. Many of the most common succulents also share an ability to grow well under the lower light conditions often found indoors. Succulents other than cacti do better than cacti in bright indirect light without much direct sun. This tough plant can exist for decades indoors and reach considerable size. Its bright glossy green leaves and sturdy succulent trunk and branches provide interest enough without flowers. Older Jade Plants (Crassula ovata) do flower, but conditions have to be just right. You can grow it in just bright indirect light, but its growth habit is more compact and leaves get reddish edges in winter if you grow it in an area where it gets morning sun. Jade Plants don’t need frequent repotting, growing best when they’re slightly potbound. They need well-draining potting mix, and it’s best to use a soilless mix meant for cacti and succulents. Water the plant when the top 2 inches (5 cm) of soil is dry. 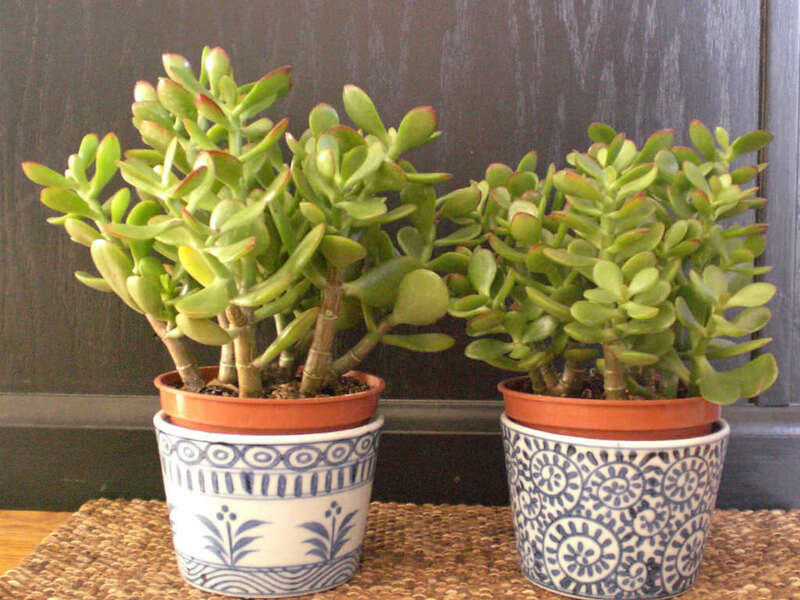 Jade Plants grow outdoors in U.S. Department of Agriculture plant hardiness zones 10 through 11. The ideal plant to grow in low-light situations, Snake Plants (Sansevieria spp. and cultivars) have been houseplant favorites since Victorian times. A member of the Agave Family, Sansevierias have leathery mottled or striped sword-shaped leaves in shades of gray, green, yellow and white. Size ranges from dwarf varieties to plants that have long erect leaves. Bird’s Nest (Sansevieria trifasciata ‘Hahnii’) is 12 to 18 inches (30 to 45 cm) high and 6 to 12 inches (15 to 30 cm) tall. It has variegated leaves arranged in a cupped basal rosette that looks nest-like. Erect leaves of taller cultivars can reach 5 feet (1.5 m) tall in different color patterns. 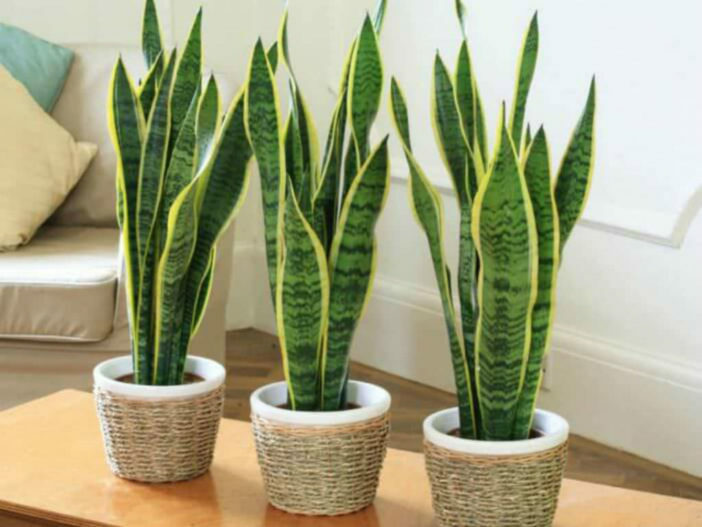 Striped Snake Plant (Sansevieria trifasciata ‘Laurentii’) is probably the most widely grown. In USDA zones 10 and 11, Sansevierias make outdoor shade garden plants. Valued for its abundant long-lasting bright flowers, Flaming Katy (Kalanchoe blossfeldiana) has large scalloped succulent green leaves with each stem topped with clusters of single or double flowers. Flower colors are red, pink, rose, orange, yellow and cream. Florists produce blooming plants year-round, but as a houseplant Flaming Katy normally blooms in winter. Native to Madagascar, Flaming Katy is hardy in USDA zones 10 through 12. 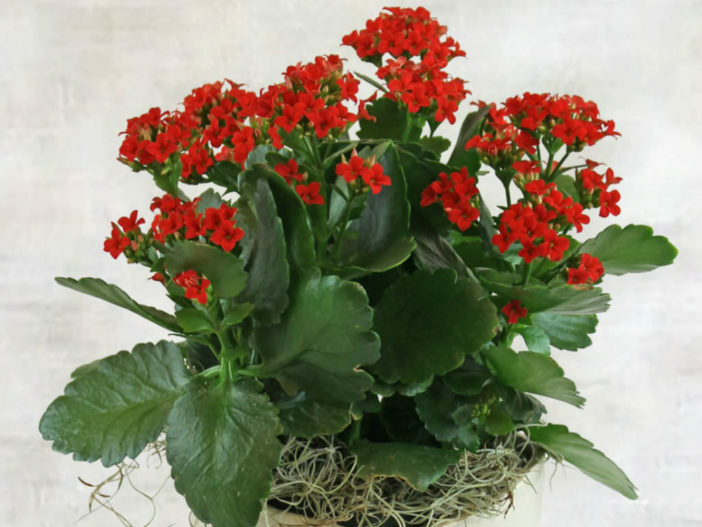 Use it as a patio plant during warm seasons, but return it indoors if temperatures approach the 30s. Give Flaming Katy a sunny spot for best flower and leaf color, but it will also tolerate bright indirect light. 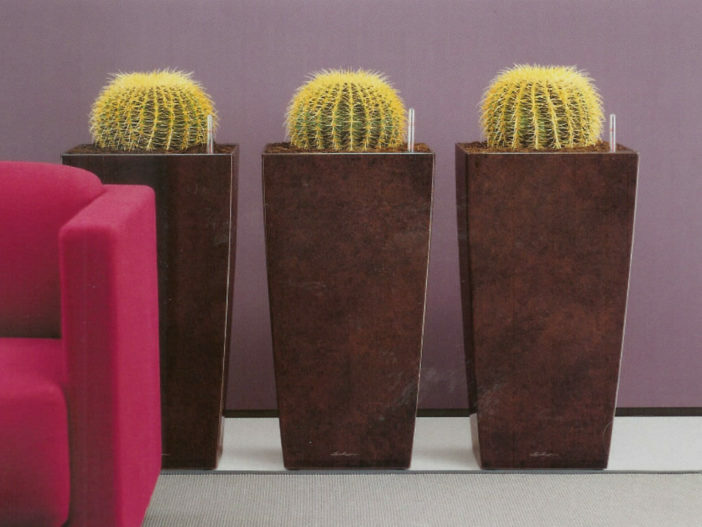 Although Golden Barrel (Echinocactus grusonii) eventually becomes large, it remains a commonly grown houseplant. Symmetrical clusters of golden spines and a compact spherical body give it ornamental value even if it doesn’t bloom for the first time until it’s about 15 years old. Native to central Mexico, Golden Barrel can grow outdoors in USDA zones 8 through 11. Plants need direct sunlight to keep the rounded growth habit and for brightly colored spines. Water your cactus whenever the top inch (2.5 cm) of potting soil is dry, which will be less frequently in winter, and use a well-draining cactus and succulent mix. Repot when the plant touches the pot rim, and then give it just the next biggest pot size. Mix controlled-release fertilizer into the soil when you repot or give the plant half-strength balanced fertilizer in spring and mid-summer.